Each year seems to fly by. It only feels like yesterday that the AGM was conducted. Since the last newsletter, we celebrated Christmas with a small get together at the Victory Hotel. About 25 members attended with some new faces attending for the first time. It is good to catch up with old soldier mates. There are some photos of the function later in the newsletter. Following the sad death of Harry Standfast, Marion Standfast (Harry’s wife) generously presented to QURA a substantial number of books and DVD’s on military history. The titles have been recorded and they are available on loan to QURA members. Harry was a keen historian and the books and DVD make for interesting reading and watching. We wish to acknowledge the generosity of Marion in making the resources available to us. I look forward to the “Back to the Regiment” social function that will be held on Tuesday evening, 26th February at the Regiment. This is a chance for members to inspect the refurbishment of the depot following the floods. At the function a framed painting of Harry Standfast will be presented to the Standfast Club to hang on the walls of the club. A separate note for the Back to the Regiment appears later in the newsletter. Many years ago the unit was lucky enough to receive several Infantry Officer Ceremonial swords from CSR to present as an award for the top marks achieved in the examinations for qualifying for the appointment as an officer in the ARES. The first sword was presented to Chris Gladstone. Chris has indicated that he wishes to return the sword to QURA to be preserved in the military collection of the unit. The sword has been mounted in a display case. The presentation to QURA will occur at the function to celebrate the graduation of the officer cadets from RMC later in the year. For those who are regular readers of the QURA Newsletters, you will recall that I continue to ask members to contribute to the historical collection of QUR. The above two activities are a very good example of events which increase the historical value of the collection. Again I encourage all members to contribute to the QURA historical collection. They can be old newsletters, the old “contact” camp news, copies of admin/ joining instructions, photos, old uniforms, old basic equipment, and written reminiscences from you about your service with QUR. The written contributions do not have to be long documents. A few sentences will do. Later in the year, QURA will be working with the CO to plan for the display of resources from the QURA military collection into the new display cabinets in the refurbished depot. I look forward to catching up with you at the forthcoming Back to the Regiment. This will be a significant event in the life of the unit and the Association. I encourage you to take the opportunity to come along to view the two markers showing the level of the floods in the depot from 1974 and 2010. I hope all members of the QURA had a relaxing and enjoyable festive season. A Combat Arms Module and Infantry Initial Employment Training Module Two course to start in early February. Preparation of over 60 Officer Cadets to be sent on Training Blocks interstate. We are expecting to graduate about 20 new officers in early February (our largest group for many years). A Staff Officer Grade 3 course and a Grade 3 Advanced Operations Course (HRR) commencing late January. The year will also see QUR take on an important new task. During the year, QUR will take responsibility for the induction of new recruits in 11 Brigade. This will see us preparing inductees for attendance at the Recruit Training Centre and conducting the required pre-course training . In addition, QUR will monitor and in some cases manage the trainees as they progress through their Initial Employment Training. The detailed planning is underway but it is proposed that we will raise a new Company within QUR to execute this task. We have had a significant turnover of staff (including every Officer Commanding) and I am very pleased with the quality and enthusiasm of our new unit members. There has been significant competition for many of the available roles at QUR, a situation that is a great reflection of our reputation and relevance. I am pleased to report that our Chaplain, MAJ Gary Stone, is recovering well from his major surgery. His strength, optimism and commitment to service remain a great inspiration for us all. Finally, I look forward to an active and rewarding social and ceremonial program this year. I am keen to both support the QURA’s activities and invite QURA participation in Regimental activities where appropriate. I have tasked my Second In Command, MAJ Luke Hughes, to develop our program and integrate it with the QURA. I hope to see many of you as you visit the Regiment or participate in QURA activities this year. For those who haven't heard, QURA member Geoff Haig had a fall last year. I have included a few emails here re Geoff to keep people informed. I went in and saw Geoff Haig, in the PA Spinal Unit, you get to it by veering hard right just before walking into front entrance of the PA. He is on ground floor ward/Bed 3. He is in fine fettle happy to talk etc. he has been there since 6 Feb - normally they stay there 6 months but he is now past that. seems it all started with his Rotary - they decided to do a Kokoda trail some years ago and he got all fit and did it. On getting back he decided to stay fit and used to walk a lot on weekends - plus a few mornings per week. His morning walk would take him through the Kenmore school oval but as the gate would be locked he would go over the top of it. After a while he decided to not jump over but to sort of slide over, perching one leg over them his bum and then the other leg and then drop off and go. he had been doing it for over a year and then this time while perched on his bum on the gate, he lost balance and fell backwards and hit his head and neck which made him numb and motionless. Long story but the Ambos rescued him and off to PA. While in there after a while he started to get DVT in the legs (no leg movements) and a blood clot broke off and got stuck in the brain somewhere. He is partially paralysed (not fully) on his RHS, but what he really feels is his eyesight in that he has lost the right side vision in both eyes. But what is really messy, is his brain keeps a picture of what is happening on his right hand side (probably from the more distant perspective and that perception of what is there is unreliable and if anything moves into that space after his brain formed a picture thereof then he gets caught out. he says he has to really work hard to try and keep a better picture of what's on his RHS - message, when you go see him, stay on his LHS. He has an electric wheel chair which he operates with his left hand and is quite mobile with respect to what you can do in a wheel chair. I asked about books etc to read, he says reading is difficult for him and slow, but he is not in need. 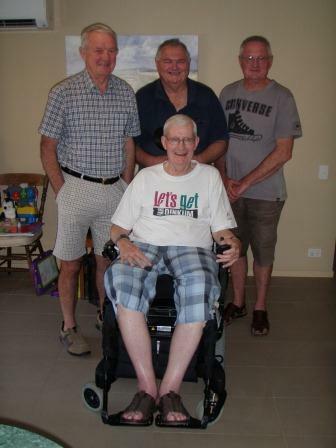 He has been getting visits from his work, his Rotary, his RSL sub Branch and the bushwalkers he used to go with. He specifically mentioned Hec MacDonald and Sam Harrison had been to see him. So I would say no pressing need to visit him further in PA, but when he gets home and has been home in Kenmore for say 6 months, it might be worth our while checking up on him. When he asked who had alerted me, I spoke about you and I and the QUR memorabilia. he said he too has stuff (books papers and other clobber) that will need to be suitably disposed of. If his stroke should get worse for some reason, then he feels his family will just chuck it in a skip. But whether he would want it to go to Ginger Beers or the Battalion or QUR (I would have assumed the former). Anyhow thanks for giving me the heads up. and please let me know when you want to go to Walcott Street, if I can be of assistance. 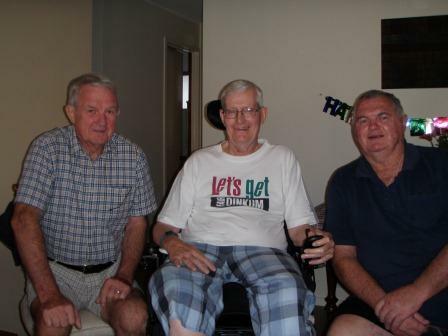 On Sunday 3 February the "Luttrell Brothers" (Denis, Brian and Trevor) visited Geoff Haigh for a cuppa. For those who are not aware all three brothers are graduates of QUR and served with Geoff in the ARES. Additionally Brian worked in the Main Roads Department with Geoff as road engineers Geoff is improving every day and has some movement back in his legs. He has a good range of arm movement although some hand/ finger movements are restricted. Geoff was in good spirits and is still mentally as sharp as he was. He is back home and is very busy with his the rehabilitation programme. Once again, QURA has lost one of its long time members - Lou Szegedi. Lou passed away on Thursday 7th February after a long fight against Mesothelioma. Lou is survived by Wife Mary and sons Michael and Steven. 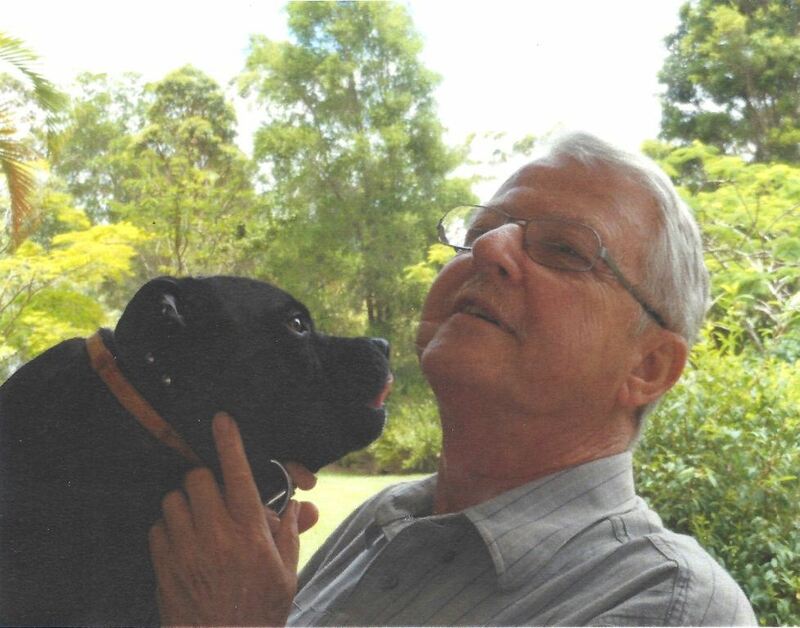 Lou retired in 2001 and Mary and he moved to acreage at Brooloo which is midway between the villages of Kenilworth and Imbil, approx 45 km south of Gympie. Lou Szegedi will be remembered lovingly by all who were fortunate to serve with him. On behalf of Lou and all of the Szegedi family I wish to offer you all a warm welcome. Many of you have probably not seen Lou for some time however your presence today is testament to you being in some way touched by this outstanding man’s presence at some time during his life. I have attempted to prepare this eulogy in a style that would be to Lou’s taste. As many of you would know Lou loved humour, detested falsehood and preferred to deal with reality. His positive style of coping served him well in his recent battle with cancer. Lou was born on 3 August 1946 in a refugee camp in occupied Germany after the family’s departure from Hungry. Two years later in 1948 Lou migrated to Australia with his family and settled in Brisbane. Lou and Mary were married in the Presbyterian Church in Kenmore which later became their home suburb for many years. 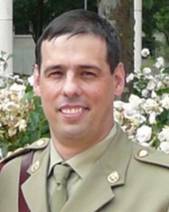 Lou received a very good education at Brisbane Boys Grammar School where it appears his love of military life was developed with 4 years in the Grammar Army Cadets. We know that his army cadet experience was followed later by two years national service with deployment to Vietnam plus an extra 18 months where he served in Malaysia and Singapore. We also know that five years after discharge Lou’s involvement in the Army Reserve commenced which lasted for 15 years and at the age of 47 years retired from the Army Reserve with the rank of Major. Lou’s civilian life commenced in the property industry where he worked for a major development company as an Assistant Project Executive, building high rise office buildings and regional Shopping Centres, while studying for four years, 3 nights a week to become a Registered Property Valuer. Once qualified Lou joined the Public service where he worked for 25 years. He was promoted to Senior Valuer (Executive Level 1). Lou excelled in his valuation role supervising up to 10 valuers and being project manager on occasions for large scale market value assessments of Commonwealth owned properties. Lou also acted as Assistant State Manager of Queensland on occasions as well as a Canberra role as Marketing Assistant to the General Manager. Lou retired from the Commonwealth public service when he turned 55 years. My association with Lou commenced 20 years ago, initially 8 years in the workplace then another 12 years when Lou and Mary decided to have their tree change and purchased a delightful acreage in the same street of my out posted office in Marroo Road, Brooloo. I have great memories of Lou when we both worked together in Brisbane and in his retirement at Brooloo. I feel privileged that he chose to live close to us where we were able to share the trials, tribulations and excitement of rural living although I was at a disadvantage as I still had to work. It was at Lou’s special bush retirement send off at Barumba Dam via Imbil where both Lou and I fell in love with the lovely Mary Valley. Little did we know then that we would soon be living in the same street? Lou as many would know was a perfectionist. He always perused a high quality outcome. As a symptom of this unfortunate affliction the level of research that Lou would put into most things was considerable. While this commendable attention to detail produced valuations of the highest quality it also had its side effects. Working in a mass appraisal environment where the numbers had to be crunched at a fairly rapid rate Lou’s desk often resembled the Berlin Wall. The work files would be packed high and wide and sometimes it was hard to see if Lou was really at work at all. Doubts in that area would soon be resolved with Lou emerging somewhat disgruntled and heading to the lift en-route to the car park floor for another desperate smoke break before returning to his refuge behind the Wall. His regular exits were always well supported with a couple of colleagues joining him to also engage in nicotine therapy. This daily routine would not end at knock off time with another hour or so spent trying to bring overdue work under control. Often he was still at work when everyone else was home breaking bread with their families. To add insult to injury he would take the most critical files home and continue the ongoing drama. It became obvious to me that the quest for perfection coupled with smoking was a very dangerous combination. As well as all his dedicated work commitments Lou had a very well defined social justice conscience and from the work floor was prepared to challenge management if he thought poor policy or unfair outcomes were being planned or delivered. The professional respect he carried both within the operational staff and management was such that Lou had some clout which allowed him to speak out and provide protection for the rank and file. After all the hard yards Lou had put in behind the Berlin Wall he was lucky to make it to his first day of retirement. He had already defied death when he fall off the roof of his house a few years before. I can remember how excited we all were about Lou’s retirement luncheon. A special room had been booked at the Irish Club. After a series of genuine tear jerking speeches especially Lou’s final message we all regained our composure and headed to the bar where the action was fast and furious. Lou as the man of the moment was being plied intermittently by admirers with those potent nasties that come in very small glasses that can be thrown down without seriously interfering with the main action being the main shout. After some considerable time and with Lou still looking the goods his stool received a gentle nudge by one of us and unexpectedly Lou went into free fall and was unable to deal with the forces of gravity. It was a wooded floor and I expected him to rise quickly and resume his seat. After 10 seconds his body remained motionless, then 20, 30, and then the horrible realisation that we had just killed our precious mate without him having one day of retirement. I was totally convinced that the damage done from the earlier fall from the roof had been compounded in this incident and there was no hope. A nurse from the crowd worked on him until the Para-Medics arrived. We told them that he had recently diagnosed with sugar diabetes and after some tests they declared that he had had a diabetic hypo and was totally intoxicated and that other than that he was fine. I was overcome with relief but we were left with the task of convincing a taxi driver that Lou had suffered a severe reaction to some food and we needed to get him home immediately. The unbelievable night ended at Lou’s Kenmore residence with Mary awaiting to receive her husband and I losing my footing and taking Lou myself and Flynny crashing sideways into the scrubs with the mighty Gazza and Avan retrieving our bodies before beating a rapid retreat. Lou’s great passions were the Military and its associated history, Dogs, Fishing and Hunting, Community Involvement and Family but not necessarily in that order. Lou was able to maintain his interest as a part time soldier in the CMF which he valued greatly. Lou’s love of fishing is legendary. Mention a fishing trip and Lou was first man picked. You didn’t have to ask him. Lou just loved being with his mates and as any fisherman would know fishing is where true mates are made. Our fishing team would remember magic moments on Moreton and Frazer where we saw Lou at his greatest level of fulfilment. He was a hard man to get out of the surf and never recognised that the fish had gone off the bite for the day. If you were fishing next to him it was hard to pull the pin as you would be subjected to ridicule from Lou for not maintaining the faith. Lou’s fishing philosophy was that the longer you stayed in the water the closer you were to them coming on the bite. Often beer or rum was used to entice him from the surf and to reduce the expected flak. He caught more fish than anyone else so I guess he had the last laugh especially when his gear was less than sophisticated with the old battered 6” Alvey and a rod that resembled a museum piece. Lou was always identifiable on the beach dressed neatly in his army camouflage costume complete with giggle hat or beaney. His fishing career ended about 6 weeks ago in magnificent style at a most unlikely spot at the pump hole on our Gympie property on the Mary River. I had planned this event as I knew that time was running out and that the maestro was keen for one more try. I had plenty of worms in my vegetable garden ready to go and I remember how excited Lou was as we dug out this magnificent bait. I drove him down the hill to the river and set him up in a plastic chair and let him loose with his old glass rod. Within two hours Lou had caught 7 good sized fish including Bass and Jew and was in a world of excitement and joy. The fishing Gods had delivered big time and as the sun set and the thirsty flying foxes swooped in along the river for their daily drink in the most idyllic setting I reflected on the most fulfilling day of my life. The photos I have of Lou in action that day will be greatly valued. Lou’s immediate family when he retired became his life. When Lou and Mary came to Brooloo they brought Mary’s aging mother with them. Lou played a big part in helping Mary care for her Mum right up until her death. Lou’s brilliant but irreverent sense of humour often entertained us when he would recall in good humour some of the hilarious predicaments and activities of caring for a Mother in Law with dementure. He loved his boys deeply and cared a lot about them. He was also very proud of their chosen partners Zoey and Sophia who were with him dispensing love and care to the end. Lou and Mary did not waste time when they retired to their acreage at Brooloo. They both joined the volunteer Rural Fire Brigade but found their fitness levels were eventually not adequate when working in the rugged hilly terrain of the Sunshine Coast hinterland. Mary then concentrated on her passion of gardening and transformed their 2 hectare property into the beautiful botanical gardens it is today. Lou on the other hand joined the SES and only recently had to retire, becoming ineffective on disaster callouts due to his worsening health condition. Lou was Vice President and Secretary of the local SES Financial Support Group for many years. He was also Secretary of the Imbil action group and liaised with the Gympie Regional Council for several years. Many of Lou’s friends would not have known that he was a Hoarder of the highest degree. I was astonished when he confessed to having all his school exercise books from grade three up neatly packed in boxes in the shed. It was always a vexing subject with Mary as she was opposed to this level of collection especially when her laundry space had been severely reduced and with this reduced space creating an impossible situation for her to operate properly. The compromise finally came when Lou decided to build a new shed and transfer his treasures there to allow the long suffering washer woman more space. The eventual transfer of Lou’s world possessions was not without incident and towards the end of two days of carting heavy boxes he did his back in and it took him a week to move freely again. I remember back then that there was a minimum of sympathy coming from the lady of the house. In recent weeks when this hording issue was raised again it was disclosed by Mary that Lou still had his “Baby Bonnet”. How disappointed I was that I couldn’t grill him on that one. The sad passing of Lou will ring home when we cease to get his great emails on everything that opened and shut. I thank him for sending me only the appropriate emails and saving me from getting the sack whilst sending the inappropriate emails to other people less vulnerable than myself. Lou especially when his illness made him house bound would send us all, emails every day and it was like he was with us every day. It seemed a little thing back then but now it will sadly reflect his absence. I will miss Lou greatly. He was unassuming and always more concerned about how you were going rather than himself. He was calm, considerate, respectful and kind and when you knew you would be meeting with him there was this degree of excitement that a great time was about to begin. Lou was intelligent but incredibly humble. He had well researched views on issues of importance but loved indulging in irreverent humour which was often spontaneous and hilarious. He could deal easily with all people and was very well respected in the community. When you were Lou’s mate there was a great feeling of privilege and I can imagine what a fine soldier he would have been. Towards the end Lou was an inspiration. He had accepted death but refused to let go of life while it lasted. Lou remained composed and cheerful throughout his ordeal. During that last week in the hospital Lou was aware of our presence and when he would wake up from an induced sleep he would exclaim “your still there, “and a little smile would appear. His continued sense of humour and his maintenance of spirit right to the end was inspiring. There were moments of intense humour when Lou would wake from a deep sleep and make a statement that would create great mirth. One such incident occurred when we were discussing whether Lou might like some ice-cream. The banter started when I was suggesting that we don’t ask Lou as it might take Lou a week of research to decide. A couple of minutes later Lou woke up and opened those large brown eyes and I popped the question. Would you like an ice cream old mate. In a slow and slurred response Lou uttered. “Might have to do some research” followed by a cheeky wry smile. I fed him the little cup of ice cream which he enjoyed and I think that was probably the last food he consumed. Lou had a few signature sayings and pet adjectives. He was always making “executive decisions”. I never met the executive but I reckoned they were very important people. Lou also had this unusual attraction to “colostomy bags”. Often in his spontaneous brilliant humour he would be wearing a “colostomy bag” or some poor unsuspecting person of interest would be wearing a colostomy bag. He even had me on several occasions wearing one of his “colostomy bags”. Lou also described individuals that he considered had little worth as “Oxygen Thief’s”. Towards the end when Lou became dependant on supplementary oxygen supplies from cylinders etc, the wicked question passed my mind, “Should I ask Lou if he had coffed up for his oxygen”. This Eulogy should not be just about the deceased but also about the living. Lou would be disappointed if I was not to mention the role his partner Mary played in his last couple of years. Due to Lou’s decision not to share his predicament with anyone including his family left Mary locked in an exhausting position of having anyone to share her nightmare with. Mary pretty much single handed fulfilled the weekly schedule of keeping house and the constant travelling associated with hospital chemo treatments whilst dealing with the obvious psychological management. She dedicated herself completely to Lou’s daily care and anybody who knows Mary will realise that her care would be of the highest quality, administered with loving detail and tenderness reflecting the wonderful person she is. On behalf of us all “thank you Mary for your dedicated love and care”. I conclude by saying, “Lou thank you for just being youself. Your mateship was greatly appreciated and the lessons in humility, integrity and genuine love that you delivered will not be wasted”. 2013 "Back to the Regiment"
The Annual "Back to the Regiment" function is on again. The QUR Depot has finally been refurbished after the 2011 flood and QURA has been invited back to see the new Depot. Due to training committments, the BTR will be held on Tuesday Evening 26th February at the Walcott St. Depot, starting at 1800hrs. Sgt Elona Drain and her CWA Ladies will be providing the usual excellent catering for the evening (Cost $20.00). Come along and see first hand the changes to the Depot and catch up with the usual "Oldies". A framed portrait of Harry Standfast will be presented to the Standfast Club at the function. As usual, partners are most welcome. If you haven't already replied to the email sent out , please email a reply to the membership Registrar by pressing Reply to BTR. I broke a tooth yesterday and got a temporary crown fitted today and my teeth are very sensitive to hot and cold. I am also quite knocked around from the operation. Please pass on my apologies. Also be aware I was made redundant from the Qld Public Service but have been successful in getting a position with the WA public service doing the same job with transport over there and start on 3 January. Just a quick to say thanks to you and the QURA for your support this year. Unfortunately, I cannot make your Christmas drinks this year to thank you personally. But the close support and inclusive nature of the QURA with current members can only bolster the strength of our tradition. Units that have strong historical links tend to also have a strong sense of purpose. All the best to everyone for a safe Christmas. I am posted out at the end of the year with my replacement being Major Luke Hughes who was recently posted to QUR prior to completing staff college. I will NOT be attending the 2012 QURA Christmas Drinks. Greetings from a very hot Melbourne today, hope the function goes well and best wishes for Christmas and the New Year to you and all QURA members. It's great to see the Unit going from strength to strength as an integral component of the ADF. I retired recently after a lengthy innings at BHP Billiton and now doing my own thing as per below - busy but not too busy! Just quickly scanned the November Newsletter and very saddened to hear of Mal's passing. A really top bloke! Let me take the opportunity to submit my apologies for the 2012 Christmas Drinks. No surprises that I would be an apology given that I haven't been to Brisbane for around 10 years. I suspect I will be in Huế at this time. Thank you for the condolences. He died very quickly on his own chair, the very way he would have wanted to go. It probably was a heart attack or heart failure. He was very tired. John Pearn rang and he said he was coming, so that will be a good representation!! All the best for your surgery. I hope you have a very good recovery. Garry Collins and myself attended. Gen Pearn was there in uniform and represented QUR as Hon Col.
Former CO Tim was also there. 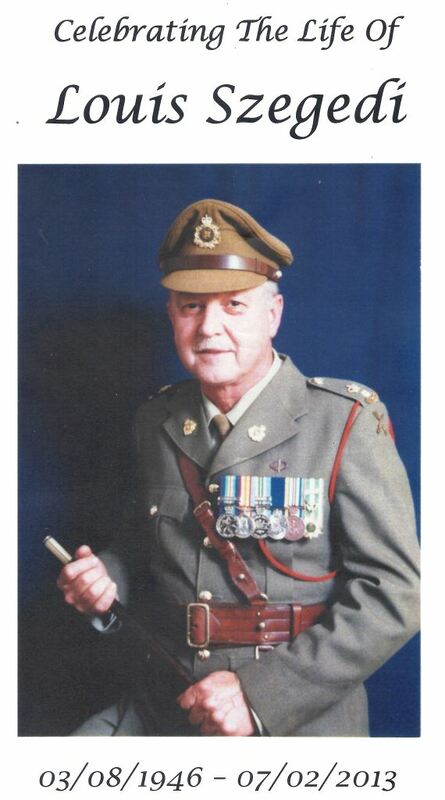 In uniform was a major and WO2 from QUR , for the CO.
Harry was an outstanding man and so was the celebration of his life. That is sad news...Harry was associated, in one way or another, with both of my periods in QUR. I have fond memories of him. Thank you for the invitation to the Dinner last night. The new Enoggera mess is impressive (but impersonal) and the meal and service were superb, however, I would like to reiterate some of the comments I made to you personally last night. These are my comments and I have not discussed them with the president of QURA. It is appreciated the difficulties you had with the QUR mess renovation time-frame, relocation, and financial restrictions and I am obviously not aware of other factors that may have influenced the conduct of the function. I have been attending the Dining-in nights for over 50 years (since I was commissioned in QUR in 1958) and accept that change is inevitable but the attendance last night from members of QURA was very disappointing. I think only one of the previous COs was in attendance and none of the Honorary Colonels. The hand-full of QURA members who attended were of the same opinion as to the reasons for this, so could I offer some suggestions for future years? Venue: Previous Dinners have been at Cromwell College with a return to our familiar QUR Officers Mess afterwards. Past officers are comfortable with this and it reinforces our contact with UQ. Timing: In the past it has normally been in May (usually the day before mothers Day). Format: In the past it has been Officers only. Last night was more of a social gathering with partners. Thanking partners would be more appropriate at a social function with serving officers. Invitations: In the past, they have usually been personalised and received in sufficient time. Function: I think it is important to retain some of the traditional formal ceremonial format that past officers are familiar with. Eg the role of Mr Vice, passing the port right to left, Menus with past COs and Honorary Colonels listed etc. We have always looked forward to this function to catch up with past officers as well as hearing the “State of the Unit” report and have been welcomed by serving Officers. It is also an opportunity for past Officers to wear Mess kit (if they can still get into it). These are my constructive comments for what they are worth. I assume there will be an account (TBC) forwarded so that I can pay for the function. Tuesday, really? They are busting my chops, honestly. It's lucky I'm working for a Brisbane-based company, now; I might be able to incorporate a visit to head office on the same day, to justify the trip down from Maryborough. BTW we (the lad and I) survived another flood - only a fast-flowing gully down the backyard and some water backing up the stormwater drains, down the street. Some tense hours, awaiting the peak on Monday night. The MUD that is home to 216 Squadron(AAFC) - and D Coy 9RQR, of course - did not fare as well, though. We were supposed to begin parading last Thursday, not sure if we'll even be able to start next week, the way things are going. No promises, yet, but I'll do my best to get to the BTR - missing the Standfast Club so much, I have a picture of it as my desktop theme. Yes, sad, I know! 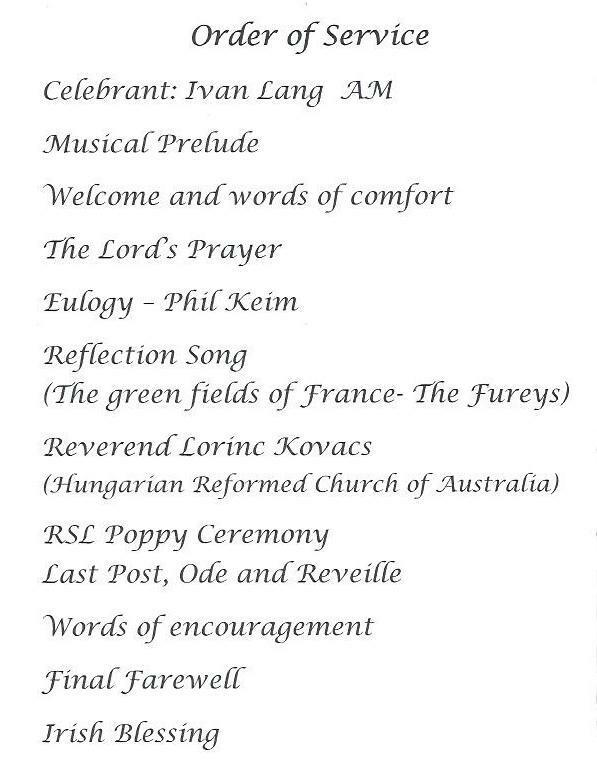 It's unfortunate that I am not able to be at either Lou Szegedi's funeral or the BTR function. Core reason is that I'll be on a cruise to NZ. In organising that trip I stumbled across a benefit which would be of value to other QURA members who go cruising with Princess Cruises. That cruise line offers an On Board Credit to current and former members of the Defence Forces of Australia and of New Zealand. The value is on a sliding scale depending on the length of the cruise. The maximum is for cruises of 14 days or more. According to the web site, the value then is $250 though I have been given a credit of $275. Applications need to be made not later than 14 days prior to sailing date to an email address given on the web site under the heading "Military Benefit". Supporting documentation is required but beyond the documents listed they seem to be fairly flexible about just what is provided. They have a standard of seven days for processing though I got a positive answer in less than 24 hours. Not a Prince's Ransom but, as someone commented to me, enough for a couple of special dinners or a few bottles of wine on board! Its been a long time and I have no good excuse for not keeping in touch other than the usual reasons of family, job, other interests etc. Anyhow the reason you probably won’t see me at a function is that I have moved permanently to the farm at Captains Mountain which is on the Goondiwindi side of Millmerran. My last professional job which I left in January 2011 was as Manager Network Planning for Australia Post in Queensland. Prior to this I was State IT Manager for Australia Post for 10 years but escaped from that just after Y2K. I enjoyed my time in QUR and the ARES in general but have never been back since I finished as CO of RURQ in January 1994. Bruce Davis and I did the Senior Course together and of course I remember well you, Col Ahern, Trevor Luttrell and too many others to name. I have always enjoyed reading the QURA Newsletters and look forward to continuing to do so. I am also still happily married to Sheryle who also served for a time in QUR and my oldest boy, Matthew, is in 4th year biomedical science at UQ. I heard from the medical mafia that COL Peter Sharwood is retiring having reached the age of 65. Peter and I were the last two serving members with a 147 Regimental Number. With Peter retiring, I am now the last member standing with a 147 number. I am on an age extension to 66 and will retire in mid 2013 just short of 49 years service. I still work 130 days per year and have done five periods of CFTS over the last 20 years. Currently, I am working as a staff officer for MAJGEN Brereton, who is the tri-service Reserve advisor to the CDF. I have also worked as Staff Officer in the Office of the Chief of Army on CFTS. Its been an interesting life. My daughter asked me for a pet spider for her birthday, so I went to our local pet shop and they were $70!!! Blow this, I thought, I can get one cheaper off the web. I was driving this morning when I saw a parked Automobile Club van. The driver was sobbing uncontrollably and looked very miserable. I thought to myself that guy's heading for a breakdown. Paddy says "Mick, I'm thinking of buying a Labrador." Bugger that" says Mick "have you seen how many of their owners go blind?" I saw a poor old lady fall over today on the ice!! At least I presume she was poor - she only had $1.20 in her purse. The wife was counting all the coins from her purse out on the kitchen table when she suddenly got very angry and started shouting and crying for no reason. I thought to myself, "She's going through the change." When I was in the pub I heard a couple of plonkas saying that they wouldn't feel safe on an aircraft if they knew the pilot was a woman. What a pair of sexists. I mean, it's not as if she'd have to reverse the bloody thing! Murphy says to Paddy, "What ya talkin to an envelope for?" "I'm sending a voicemail ya thick sod!" Thanks for the update. It is great to hear of your adventures into the world of art. What you are doing by keeping us in the know is basically what the Association is designed to do....... maintaining contact with our family. I would enjoy your informing us when your new work is release for public viewing so we can follow your successes. It’s been several years since I last wrote to you so I thought I’d take the opportunity to let you know the latest. You may well recall that my wholesale nursery Price’s Palm Plantation took an almighty hiding from cyclone Larry back in March 2006. QURA very kindly aided us with monetary and moral support as we gradually recovered and rebuilt the business. Then as luck would have it Cyclone Yasi thought it would clean up what little Larry had left…..which it did. Who would have thought that primary production would be such a tough job!? Nonetheless every dual nuclear blast has a glow in the dark lining……that lasts for years!! Whilst we still own and operate the Plantation I have unexpectedly taken up a new role, that of artist. For a person who had never picked up a paint brush, except for household chores, this was most unlooked for. Yet, I experienced what could only be called an artistic epiphany whilst scuba diving on the Great Barrier Reef. So I went home, built a small studio and started painting what I saw, in oils on canvas. Purely by chance a fellow, who is an architect/sculptor came by my studio and declared “You need to show this work in New York”. It seems that he was right. In fact, I had my first Exhibition in New York City last September that was a great success. So much so that I’ve another much bigger Exhibition planned with a major Gallery in Hollywood later this year. I met the billionaire owner when my wife and I stopped over in LA for the meeting following the NYC Show. He told me of his plans to bring the best art in the world to LA and that he wanted ten large pieces from me for this very purpose. I’m not sure if there are many contemporary abstract art lovers in the ranks of the QURA. However I thought they may be interested to see how life can have some delightfully unexpected changes along the way. There are lots of other interesting things stirring at the moment so I will keep you updated with my artistic adventures from time to time. What a perversion of morality to wish to abolish heroism among men! The military value of a partisan’s work is not measured by the amount of property destroyed, or the number of men killed or captured, but by the number he keeps watching. An armed, disciplined body is, in its essence, dangerous to liberty. Undisciplined, it is ruinous to society. When an officer comes on parade, every man in the barrack square should tremble in his boots. Allow soldiers to marry and they will no longer desert. Bound to their families they will also be bound to their country. It was the only war I reported on the wrong side. It was Nelson’s maxim, that, to negotiate with effect, force should be at hand, and in a situation to act. The less a government costs, the more it’s worth. If a government is getting up your nose, then picket. The bore is the one who insists on talking about himself when you want to talk about yourself. “Hey waiter this coffee tastes like mud.” “Well it was ground just a half hour ago. Every morning I have coffee with two lumps; my wife and her mother. Pop remembers the times when beer was threepence a loaf. Marriage is one business that usually has a silent partner. Never leave a turn unstoned. Obesity - surplus gone to waist. Lactic – a grandfather clock which does not work. He suffers from alcoholic rheumatism. He gets stiff in most joints. The seventh commandment is thou shall not admit adultery. Why are there flotation devices under eats in airplanes instead of parachutes? Why don’t they make the whole plane out of that black box stuff? Whoever said money can’t buy happiness, simply didn’t know where to go shopping. Would you have to quit your job at the orange juice factory if you couldn’t concentrate any more? With everything you read about spray cans and the ozone layer it’s a wonder it doesn’t scareosol to death. Would an inebriated man who took a dip in a Scotland tourist spot (where there is a law that says you can’t be intoxicated while swimming in the lock) be charged with public drunk in Ness? Old salesmen never die; they just go out of commission. Old mediums never die; they just give up the ghost. You know you’re reading a boring book when the covers are too far apart. If you want a pretty nurse, you’ve got to be patient. There is but one way for a newspaperman to look at a politician and that is down. College Professor – One who talks in other people’s sleep. Art is about making something out of nothing and selling it.